The American Heart Association has certified some brands of oil roasted salted peanuts with the Heart-Check mark, making it easier for consumers to identify Peanuts as a heart-healthy food. Due to the strength of evidence of peanuts and heart-health, the FDA released a qualified health claim for peanuts over a decade ago. 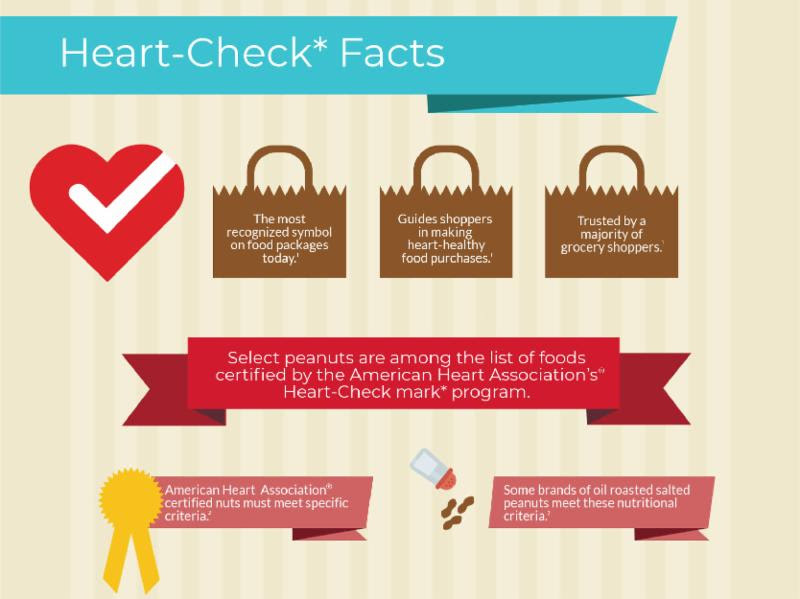 American Heart Association certified nuts must meet strict criteria for a heart-healthy food and select peanuts are among the list of foods certified with the “Heart-Check” mark. AHA-certified nuts must meet specific nutritional levels. Some brands of oil roasted salted peanuts meet these nutritional criteria, just look for the Heart-Check mark. Peanuts are naturally very low in sodium and most of the sodium in salted peanuts comes from surface salt. One ounce of salted peanuts typically contains less sodium than a slice of bread. Download a PDF file of the Complete Heart Healthy Infographic Here.